Water Heater Installation | Brooks Plumbing Co.
Olympia WA Water Heater FAQ: How Do I Know What Type of Water Heater to Install if I Upgrade? Are you thinking of upgrading the water heater in your Olympia, WA area home? Your first step is calling the water heater experts at Brooks Plumbing for advice and to help you in your selection. We can help you determine the load calculation for the amount of hot water you need to adequately supply your entire plumbing system with hot water. This will help size your new water heater and ensure that you aren’t left without enough hot water for everyone in your home. Your hot water usage will also help you determine which type to install as your upgrade. There are two basic styles of water heaters: tank and tankless. Most homeowners heat the water in their homes with a tank water heater, but if you find that you run out of water often, you may need a larger tank, a more efficient water heater, or you may consider upgrading to a tankless water heater. The newer tankless hot water heaters are a great solution if you want on demand hot water without having to wait on the tank to refill, or if you are losing energy in standby losses. If the recovery time on your tank water heater has increased gradually, it may be time for a new one. Replacing a water heater is not an easy decision, but one that can offer energy savings and more reliable hot water for you and your family. Make sure you hire a professional contractor you can trust. If your water heater isn’t sized correctly, or if another type would benefit you more, you won’t get the most out of your new investment. Call the Olympia, WA water heater specialists at Brooks Plumbing, and get started today! Contact Brooks Plumbing! Posted in Water Heaters | Comments Off on Olympia WA Water Heater FAQ: How Do I Know What Type of Water Heater to Install if I Upgrade? Investing in any new appliance requires a certain amount of research and a lot of decision making. Before a water heater installation in Olympia, you need to know that you have made all of these decisions correctly. Contact the water heater experts at Brooks Plumbing Company to ensure that you get the right water heater installation in your home. Our professional Olympia plumbers have extensive knowledge of both tank and tankless water heaters. Whatever questions you have about your water heater installation, our team will have the answers. Contact us today for more information. One of the biggest decisions you will need to make about your water heater is what size is appropriate for your home. In order to make this decision correctly you really need to consult a professional plumber in Olympia, WA. There is simply no way for you to be sure that your water heater is properly sized without the input of an expert. If your water heater is too small it will not provide you with the reliable performance you deserve, and if it is too large it will be heating water you simply don’t need. Get the most efficient performance possible from your water heater by ensuring it is the right size for your home. You will also need to decide whether you want to purchase a tank or tankless water heater for installation in your home. Both have their benefits, so you should consult a professional Olympia water heater technician to decide which is best suited to your personal needs and habits. Storage tank water heaters are very dependable and hold a large reservoir of hot water at the ready. However, they do suffer some standby heat loss as they wait for use. They also require a certain amount of space. Tankless water heaters do not experience heat loss, as they heat water on demand. They can be overwhelmed if hot water is demanded at multiple points of use, though. For more information about water heater installation in Olympia, WA, call Brooks Plumbing. We are always here to share our expertise. Our goal is to find you the perfect water heater for installation in your home. Olympia WA Water Heater FAQ: Can I Install My Water Heater On My Own? Brooks Plumbing Company has been offering Olympia, WA water heater installation services since 1994. We are dedicated to providing excellent customer service, and we take pride in the work that we do. 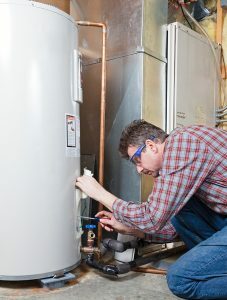 Installing a water heater should be handled by a professional Olympia plumber. This is not a DIY job for many reasons, namely because you want to make sure that it is installed properly. There are other reasons that you should only hire a qualified plumber to install your hot water heater. Gas water heaters, for instance, will require services from a certified plumber in Olympia, WA who is licensed to work with gas piping. There are also ventilation concerns that should be addressed by a qualified professional. Never try to install any type of gas appliance on your own. This is mainly for safety reasons, but you also want to make sure that it is installed to provide lasting results. Professional installations also prevent repair needs. We see broken water heaters all the time that weren’t installed properly, and usually the repair is a result of this. This will cost you more in the long run, since you will most likely have more repair needs further down the road. You may have to even replace your water heater earlier than expected. Always call a professional Olympia plumber to install a new water heater. In addition to installations, the Olympia WA water heater experts at Brooks Plumbing, Co. can also compare the different models with you and find the most cost-effective solution for your hot water needs. Call us any time to set up a consultation. Contact Brooks Plumbing Company today! Posted in Water Heaters | Comments Off on Olympia WA Water Heater FAQ: Can I Install My Water Heater On My Own?